The railway line linking Fianarantsoa to the East Coast was inaugurated in 1936. It took no less than 10 years to build this 101 miles structure with 18 stations, 48 tunnels, 4 viaducts and 67 bridges to link the city of Fianarantsoa in the highlands to the coastal city of Manakara. The rails even go through the airstrip of the aerodrome for a smooth rail-to-air cohabitation due to the scarcity of frequencies on one side as well as the other. Construction was an exercise in style for its designers, and a gulag for all forced laborers who left their lives behind. 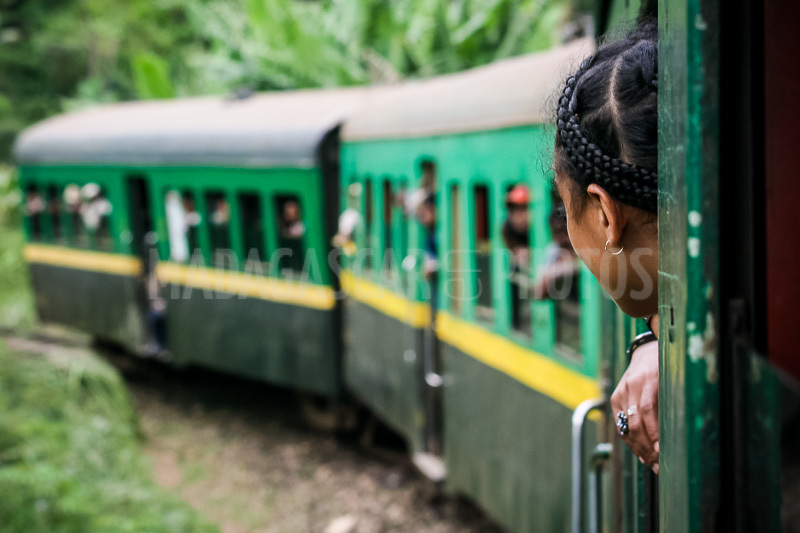 The "little train of the cliffs" nonchalantly skirts the steep slopes of the highlands to join the Indian Ocean, mixing history, culture and folklore, the long stops in each station allowing to imbibe the life of the surrounding villages for whom the train Is the key factor in its economy. At each stop in station, myriads of small sellers rush to the windows of the wagons to sell fruits, cakes, crafts or drinks to quench the thirst of the traveler very affected by the discomfort of the stages. It is also popularly known as "Malagasy TGV" for "Great Vibration Train", because not only wagons of the 60's are rustic comfort, but the rails are even older and now very damaged. For the purpose of the construction of the FCE line, the French brought rails which were recovered at the end of the First World War on a railway line in Alsace. The train is essential for the people who live in the highlands, in totally isolated villages, there or more no off-road vehicle passes. The FCE line is vital for the survival of these villages, because besides the fact that the train brings all the necessities, it is also the only means of exporting the productions of these regions to the great city of Fianarantsoa.